August is the month where most students head back to school. Many who live in the south have already started, and within a few more weeks, all will have started. 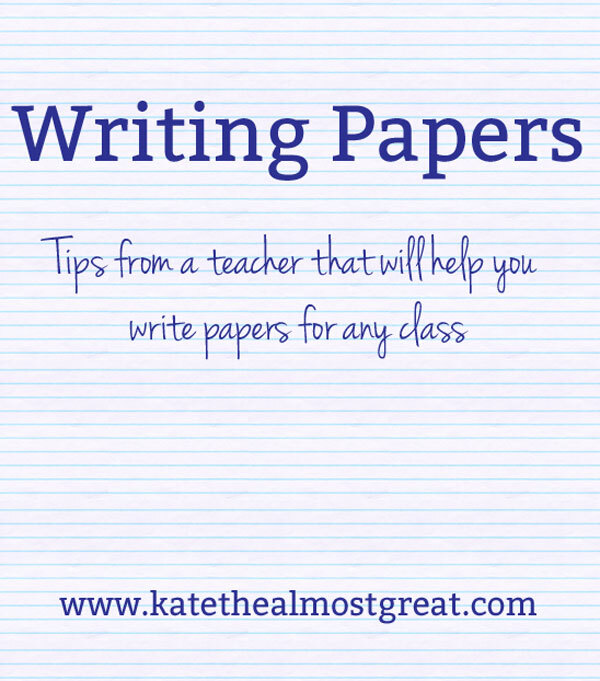 And whether you (or your child) is in high school or college, you will probably be writing papers. 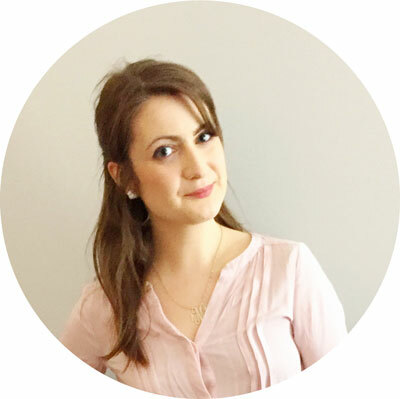 So this seems like a good time to bring back Teacher Kate, who has been absent on the blog the past couple months since writing a grammar guidebook. Thesis Statement Tips: The thesis statement is how you tell your reader what your opinion is and how you’ll be proving it. First of all, yes, it does need to be an opinion; but it’s an opinion that can be proven. Can someone say, “I don’t agree with that”? If not, then it needs to be changes so that there’s an opinion in there somewhere. Your thesis statement should generally be only one sentence; however, when you’re writing a long paper (more than 8 pages), then it might be two. It depends on the topic and the complexity of your topic. In terms of where it goes in the introduction, it is always at the end of the introduction. 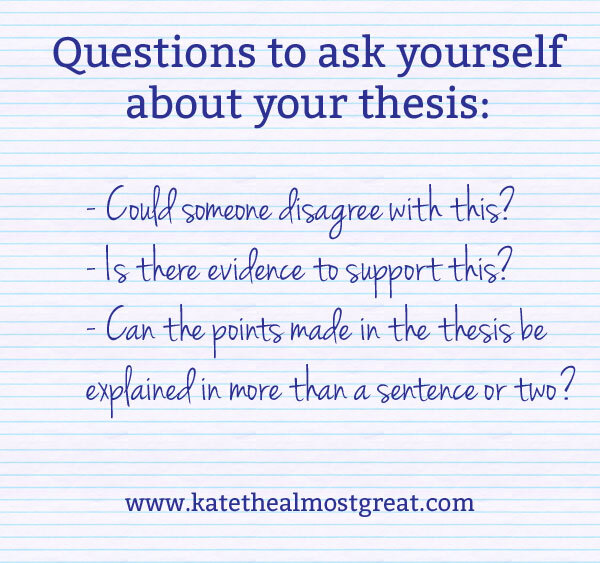 Your thesis statement also introduces how you’re proving your opinion. I don’t mean specifics; it’s more general than that. For example, if you were writing a paper about a theme in Romeo and Juliet, your thesis might say that Shakespeare’s characterization of several main characters demonstrates a theme. The discussion about what how the characterization of Romeo through his dialogue with Juliet demonstrates that theme is reserved for the body of the paper. Here’s a formula to help you start forming a thesis statement: (Author) demonstrates (opinion about the text) in (text) through (evidence 1), (evidence 2), and (evidence 3). This might look like: Shakespeare demonstrates the importance of parental guidance in Romeo and Juliet through the main duo’s actions, the responses of their parents, and the prince’s speech at the end of the play. Here is another: (Something) in (text) teaches readers that (opinion) is more important than (opinion), as seen by (author)’s (evidence). This might look like: The choices made by Romeo and Juliet in Romeo and Juliet teaches today’s young readers that independence and free choice are more important than following the rules, as seen by their dialogue with each other and their parents. Using Evidence Correctly: Now about that evidence I just mentioned. In thesis statements, it should be more general, but that’s definitely not true when it comes to the body of the paper. This is the point where you should be as specific as possible, both with the actual evidence used and how you explain it. 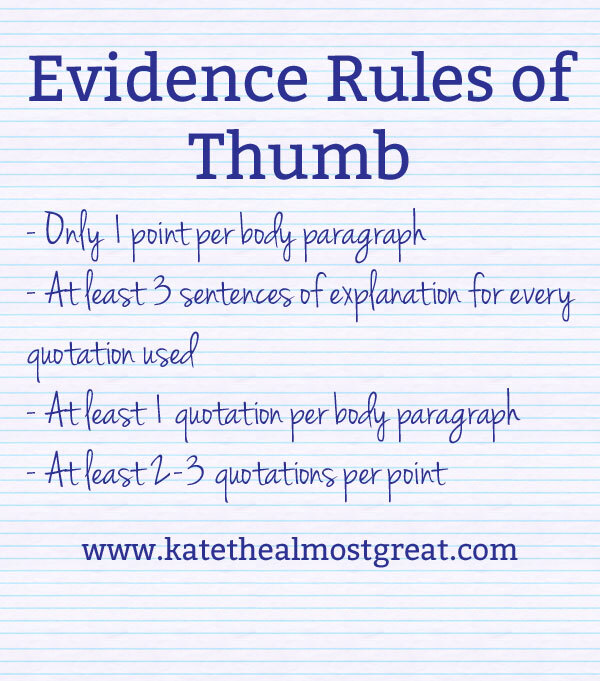 When it comes to your evidence, pick one point per paragraph. It the paragraph gets too long – as in, one page is pretty much all one paragraph – split it up. There are some other rules of them, as seen below. The biggest mistake that people tend to make when it comes to using quotations is they don’t explain them enough. Sometimes, the quotations and how they relate to the point being made are blatantly obvious to everyone, including the reader. Even then, though, you should try explaining them. First, give a little context. Where is this quotation in the text? Then, make the connection between the quotation and the point you are making. For both of those, you may need to use more than one sentence, so be prepared for that. When the author says, “They ran around the field,” she means that they emotionally ran around the field. After saying that, you would write some sentences about how you know this and how it applies to the point you are making. Introductions Versus Conclusions: When I was in high school, I had the problem where my conclusions sucked as conclusions. My teachers would always make me reword the conclusion a bit, slap the thesis in it, and then make it my introduction and come up with a new conclusion. Your introduction explains why it matters that you wrote the paper and what it is about. The conclusion wraps things up. If you are writing a shorter paper, your conclusion does not need to recap all of your points; the reader just read the entire paper. Essentially, though, your conclusion looks at how the different points are connected to each other and how they prove the thesis statement. And don’t do the cliche thing and end the paper with a question about the greater world, okay? Help! My paper is too short. How do I make it longer? I’ve already bs-ed as much as I can. Let’s be real, we all know that’s what you’re thinking half the time. Add another element to your thesis statement and your paper will have to be longer in order to successfully prove it. When writing papers, do I spell out numbers? Do I use abbreviations? Can I use “I”? Yes, no, no. Do you have any questions? I would be happy to elaborate on any of what I said in the comments or to answer a question I didn’t bring up here.